"WinTab" library for tablet input for some reason doesn't work correctly under "Windows 10 Fall Creators Update" on Surface devices. Enable "TabletPC" inside "Edit > Preferences > Tablet Library > TabletPC". We stopped to build "3DCoat" under old Linux CentOS 6 ("GCC" compiler from old CentOS 6 makes errors during optimizations). Soon we will try to make native "3DCoat" build under newest Ubuntu using its latest "GCC". - Fixed problems related to tiling and filling layer with material. - Fixed a lot of errors related to curve modifiers and instancing volumes, loading/saving scenes with instances and modifiers. - Fixed "To uniform + Undo" problem. - Fixed problem of mesh exploding during extrude faces in retopo room. - Context sensitive RMB menu in retopo room, it is especially helpful in "Select" tool for low-poly modeling. - Extrude-like tools in retopo room are more convenient and intuitive, similar to other 3d editors. - Sharp edges marking in Retopo room. Baking, import/export supported. - In UV settings you may control the default unwrapping method. - List of ghosted, isolated volumes stored into scene file (3B). - Bunch of crashes fixed. - Unwrap method "To stripe" polished and set as default within "Unwrap" command to be used when applicable. This method unwraps strips of quads into accurate and straight lines. Unwrap detects such cases automatically. - Voxelizing dialog offers new options - closing holes and additional subdivision before the voxelizing. - Options for automatic holes closing/additional subdivision during the voxelisation. - Pose tool angle snapping problem fixed, switching from other tools to Pose tool transforms freeze state to pose selection, Undo problems in pose + free form fixed. - fixed various pose undo problems. - Magnify depth tool works correctly for sculpt layers. - Clone tool for sculpt layers works correctly. - FillTool + sculpt layers are working correctly. - Enabled eraser tool for sculpt layers. - Possibility to unwrap stripe-like UV islands into straight lines. Use "UV->Selected->To Stripe". - Store pose selection to layer, picking pose selection from the layer. Works similar (to some degree) to poly groups in ZB. - Edge for all curve modifiers may be customized in really rich way. - Less memory consumption during the export. It means possibility for stable 16K textures export. - Unused locked textures will be deleted automatically to save disk space. - Running several different versions of 3D-Coat will not interfere with each other. Previously it was causing problems with Undo, eliminating cached volumes. - Very important! Possibility of resolution-independent texture locking over the layer. Importing or calculation of normalmap, occlusion, cavity will lock layer. Texture will be saved to disk. As soon as you will change resolution, the locked texture will be used instead of current layer state resampling. It is very important if you want to paint materials in low quality of texture and then get high quality at the end. - Fixed polygon - painting mode (in E-panel) for materials painting in UV mode. - "Ghost but this" corrected, it is not screwed by Undo anymore. - Toggle UI visibility using TAB or Windows->Toggle Popup/Docked Windows. - Create alphas from 3D models updated - fast preview rendering (previously it was software rendering), so high-poly meshes allowed there. - Image files recognized not by extension (that may be wrong) but by signature. It prevents multiple user errors. Sometimes files, downloaded from internet have wrong extension. - Correct alpha channel visualization in paint mode for polygonal models (not voxels/surface!). Polygons sorted from back to front in real time for correct rendering. It works fast, but if you feel it is slow, you may turn it off in View menu. - exr added to the list of extensions, acceptable for pen alpha. - Importing models as alphas window is now hardware accelerated, big models acceptable too. - EPS files import corrected. - Fixed problem of 16/32 bit tiff/exr alphas importing. - Correct undo after voxelization of the volume, attached to curve. - Fixed problem in curves tool - sometimes only one instance of the model was appearing. - more intuitive job with "Virtual mirror" in retepo room. By default the active side is where more polygons placed. - Switching between camera shortcuts does not cancel chosen material. - zipping scenes polished, but still requires testing. - Fixed many different undo issues. - Better picking edges/points in retopo room even if pen radius is tiny. 2) Edit plaсement and paint over ref images are separated to different menu commands to avoid unintentional painting. - Fixed problems related to pressure. - Zipping-on-the-fly now optional, turn it on in Preferences->AutoZipScenes. Now it works safely, even huge scenes supported, no contradiction with undo. The problem with undo existed for a long time, now fixed. Generally need to test this feature before serious usage, but IMO it is now stable. - Fixed hide tool issues, modifying hidden areas protected whenever possible. - Important! 3B scenes are zipped on the fly, so will take much less space on the disk! Saving does not lock main procss, so you may continue to work while 3D-Coat saves scene. - Fixed crash related to screenshot in multi-display mode. - "Naive" padding seamlessness improved essentially. - Smooth all in surface mode works correctly with multiselection. - Booleans in surface mode - more stable and faster. Soft booleans! - rotate/scale buttons in transform tool. - Generally faster brushing in surface mode because of faster picking algorithm. - The removed redundant offer of old-style occlusion baking. - The removed invisible close icon in UI that was leading to unexpected windows closing. - Better UI for export dialog. - Multiple stability improvements, UI related bugs fixed. - You may display chunks length, double-click over the number will change it to the given value. - Partial extrude, selected points only. - Possibility to display length of chunks between sharp points (in curve RMB settings), double-click on the value will change the length without affecting neighbor lengths. Important improvement! Much less memory consumption for per-pixel painting. Stiil requires some testing if nothing is broken in PPP. - Problem of flipping pen direction fixed. - fixed rare crash related to complex UI configurations. - Reproject tool polished, correctly works with scale, well documented via tooltips, may project color and depth and keep all this in layers. - Fixed painting with symmetry problems - incorrect alpha rotation. - Correct lasso job in UV preview window. - 3DC does not calculate cavity/occlusion for invisible objects. - Solved problem of UI layout changes during new/import/applinks interaction. - Fixed problems of RMB/LMB outside the curves window. - Fixed Undo issue if you delete object from the vox tree using backet icon. - Proxy additional warning to prevent loosing cached volumes. - Doubleclick to delete point in curve window, correct edit of Tapering and other windows with curves on smaller screens. - Highlight volume information correctly stored, not lost after Coat's restart. - fixed flickering of UI during depth opacity changing. - correct points extrude function over partially selected curve. - Open VDB codec enabled. - baking corrected. There was a lot of problems of baking non-closed objects in surface representation. - a lot of polishing of different tools. - back side of curve visibility toggle. - a lot of polishing and bugfix. - Polished Joints snapping tool. - Continuous development of curves. - Correct "Run brush along curve" - it was not working for some UI layouts. - Fixed problem of metalness painting with custom alphas. - Snap joints tool introduced, this is kitbashing, lego-like modeling. It is suitable for children and for adults. Only a few models there, we will extend kit by the time. - Huge changes in curves. Filling curve by patch works stable and provides good quality. Filling with holes inside supported. Just add curve in sub-tree of filled curve and it will be treated as hole. Boolean operations between curves in 3D. Many changes related to curves. - Tutorials/scripted missions for newbies introduced for fast diving in! - Import Raw Voxel data speeded up 10 - 20x. - Skip textures export if need (checkbox in export dialog). - Axial rotation in text primitive. - Select visible islands in UV/Retopo rooms with rectangle. - Store camera/[panorama data to the preset. - Curves "Apply" corrected to work in all tools. - Better picking corners in all windows where curve edit required. - Retopo via decimation works correctly with objects of non 1.0 scale. - Correct Transform+pick volumes. Use CTRL/SHIFT to select/unselect. - Fixed potential instability in Light Baking Tool. - RFill (Quad Fill) included into regular retopo toolset, corrected to work as expected. - fill by patch remade. Should be faster and more accurate. - Correct EPS/spline import export. IGES supported. But IGES is not included in community version, if you need to test it, send me request I will send special key. - possibility to link several points if snapping to points enabled. They will be moved together. - fixed several important bugs related to undo. - Instant meshes integration. 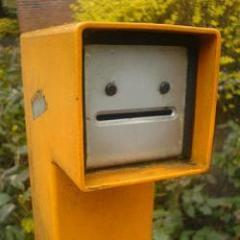 Press RMB over object, AUTOPO->..... It supports symmetry. Don't expect too much. It is about robustness and stability, but not about too great quality. - Autopo density problems fixed. - Posibility of 16-bit export for displacement in export constructor. - Metall support in picture transform tool. If gloss enabled, imported image will be with metallness. You may vary it with slider. - CTRL+UnifyUV to unify UV sets with same names. - Import multiple objects for PPP. - Correct PSD export, correct dropping to PS with smart materials with masks. But still have problems with attached materials. Export is OK, getting back is sometimes problematic. 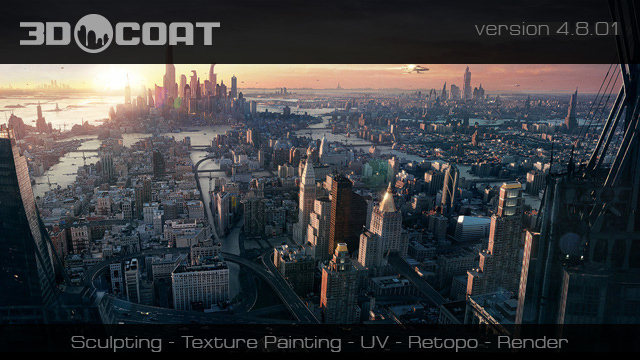 - If 3D-Coat unable to start, it tries to diagnose and troubleshoot the problem. - Prevenfing pivot to appear far from scene boundbox. - To Global / To Uniform space works correctly with multiselection. - Save VoxTree elements as 3B file works correctly with multiselection. And many other corrected to be compatimle with multiselection. - Smart transtion between perspective and orthographic mode that keeps scale of scene near the pivot point. - Correct pivot point management. Avoiding situation when it is randomly set somewhere outside the real scene. Left/Fromt/... views corrected to avoid - situations when you see nothing in scene after switching. - Primitives in primitives history correct boolean operation type update. - Curves modifiers got button "Attach to selected curves". - Fixed symmetry painting bug (with unsymmetrical alphas). - Constant growing in voxel "Airbrush" tool as written in description. - VoxTree multiselection support. Still needs some testing if it works correctly for all mode. Please report where you see it fails. There are too much applications of multiselect, so something may be missed. Both VoxTre and Curves tree support CTRL, SHIFT, CTRL+SHIFT multiselection similar to explorer. - New Curves are in good beta state. Enable it in Edit->Preferences->ShowNewCurves. Pay attention to RMB menu over curves. - Calculator in each input field. You may enter expressions instead of nubber anywhere, where you need numerical input. For example, enter 1+2 or sin(1.5) or any arithmetic operation incliding trygonometry. - Highlighting for selected objects. When you select object it flashes shortly a little to locate it easily. - By default Auto Pick enabled, more easy switching between objects. - Faster Bas-relief & undercuts. - "Paste merged" in "Rect/Transform" tool enabled. Seems it works correctly in PPP. - Possibility to pack selected islands into rectangle in UV Settings tool..
- Snap selected only in retopo room works correctly. - Add Layer 1 automatically when trying to paint over voxel volume. - Problem of depth when filling with Smart Materials fixed. - Save/Load multiple splines, extrude, duplicate for curves (I mean new curves). - Fixed problems of Rect/Transform tool in Paint room - crash, missing controls. - Additional anti-aliasing samples in cavity calculation. - Possibility to tweak vertiсes in Quads mode. - Updated transform gizmo - non uniform scaling in plane introduced. - Correct SHIFT constraint outside the object in lines lasso mode, correct deleting hotkey (no auto - restore keys of undefined actions), correct lines mode work in several voxel tools. - Baking problems fixed. Better direction of scanning (angle -weighted), support of N-gons (N up to 128). - Snapping to curves, snapping system completely rebuilt. - ENTER to APPLY curves. - split curve by click in adding points mode. - Smart Materials depth scaling is now independent on ortho/perspective/viewport and on viewport size / FOW. - Added "Preferences > Tablet Library" selection between "WinTab" and "TabletPC"
- New Curves are much more functional now. Still a lot of work there. Find it in Preferences->ShowNewCurves, then enable spline lasso mode in E panel. Look also RMB menu over newely created curves. - Correct FBX export/import. Nodes hierarchy, transforms, pivots will be preserved. - Fixed normal sampling and picking position for non-current object in clay/flaltten and similar tools. - Correct Constructor tool snapping. - Correct usage of current color in Smart materials. Current color will be stored in attached materials as well. -A lot of polishing in Primitives, many bugs and inconsitencies fixed. -A lot of time was spent on updating curves, it is not finished, so not exposed in this build. You may alphatest it, enable Edit -> Prefereces-> ShowNewCurves, restart 3D-Coat. Keep attention, it is alpha version, many things are non-functional. Press E and select Lasso of splines. - Fixed problem of texture preview when you edit shader. - Bake menu in Paint room. It allows to drop paint objects to Sculpt room, modify there and bake normal/other maps back on paint object. - Plane tool in paint room works correctly with normalmap layer. - Sticky kays activation time increased to prevent false sticking. - fixed problem of very long importing for PPP in some cases. - Cubemapping for smart materials on textures in correspondence with normalmap, not just with geometry like before. It leads to more accurate mapping if normalmaps used. - Correct import of envronment maps restored. - Distortion of alpha removed when applied to very distorted area. - Sharper mapping of materials in UV mode. - UI in bigger size cleaned up. - little tweaks to make medium/large UI modes to be correct. - New set of smart materials! - Bump for materials is now pen radius independent! It correctly depends on material scale. - Correct show/hide start menu, scaling Start menu in correspondence with screen resolution. - Correct UV-ed faces subdivision in retopo room. - Correct default parameters in Wrap/Axial tools. - Added the outer radius into retopo torus primitive. - Fixed problem of long droplists/menus with scrollers. - If by some reason cache information is lost, you will be warned during the scene loading. Interests:Sculpting, Rendering, Modeling, Hand-Paint, Hair grooming, Travel, Music, Games, TV-Series like as "Walking Dead", "Supernatural", "Stranger Things" and etc. Ive noticed a bug when changing uvs on a model that has paint layers.If the uvs are changed around ,then after the rebake of the paint info of the layers the normal map displays wrong and shows seams .I looked at it and I think maybe what is happening is that the vertex normals on the mesh are getting lost when the rebake happens. Linux link is wrong. It downloads the 4.7.37 version. Just clicking won't do it. Please 3DCoat team, fix the links. By the way, it's not the first time this happens. Maybe you should automate the link generation? Spent most of yesterday migrating all my resources over to v4.8, so far so good. I look forward to seeing some of the fixes from v4.7. there are some features that I dont really quite understand how they work, will it be possible to have a video showcasing all the new stuff? Yes. But how can I change to Tiny, Normal, Large? For example, my Smart Materials are in Huge mode now and there is no special menu in the top right corner. Upd. : I found a way. I had to make Smart Materials manager wide enough, so that special menu appeared. But it's kinda hidden and can be obscure. And by the way, if someone can have too many folders that menu will never appear? I have a drop down list for my smart materials and do not see the special menu you speak of. All I see is the plus icon on the far right to add a new folder. I have a drop down list for my alpha tab too and that does have the arrow to adjust the preview sizes though. So might be a bug the smart materials are missing that when a drop down is present. 1) It would be very nice to have the names for each smart material as a toggle option to show up under each material. I know this has been mentioned before, would still be greatly appreciated as an option. 2) Hovering over each material is like playing whack-a-mole sometimes. The tootip that appears to show a larger preview and the material name seems inconsistent on where it will appear on my screen. Sometimes it appears on the left side and other times when I hover over another material the preview is much lower in the middle of the screen. Thanks a lot for this very welcome updates. I the coming days I hope to start exploring all new features, but I think that it should be very desirable to have some new video tutorials about that. In the meantime I found that there's a little some issue with the UI. 1) In the Sculpt Room the Quick Access window has no labels but only icons. Labels are invisible. 2) The Smart Materials Tab of the Paint Room doesn't reacts properly to the RMB to change the materials. Only if I pick the little arrow and the "Folder" menu item, it works. It works like this: " - If there are too many folders in materials/stencils etc, they will be represented as droplist. " The thing is that arrow disappears in smart materials when they represented as droplist. I think Andrew needs to drop that long list menu when RMB a Smart Material. There is no need for all those folders to be shown. It doesn't really do anything and worst of all, it forces the user to reach way up to the top of the UI just to click the SMART MATERIAL EDITOR. That option needs to be right at your finger tips, but it can't due to that mile long list pushing it to the top of the UI. As for the Quick Access panel, I suspect Andrew hid the labels to minimize the amount of space that panel takes up. It's HUGE and often requires more effort to locate and select the tool you want, than the Tool Panel on the left. That's why I rarely use the Quick Access Panel. The very second you hover over the icon, the tool name appears...so again, I think Andrew probably removed the label for a good reason. If nothing else, it helps reduce the visual clutter in that panel. Can we have a build that don't trigger win 10 smart screen protection and the prevent message which ask you to run anyaway at your own risk the app as the publisher name isn't signed. The Smart Materials Tab of the Paint Room and the Shaders Tab of the Sculpt Room don't react to the RMB in order to change the current folder. It works only if I pick the little arrow and the "Folder" menu item, or the menu shown as Buttons. RMB works also with Stencil Tab. I'm having an issue when I'm trying to set a new hotkey to replace the default MMB (Pan the viewport). If i assign any other key, the viewport will slowly shift the camera left as you hold the button down, instead of going into panning mode like holding the MMB would. Could we rerun the method for porting resources to the new build? I confirm the bug found by Cleitus : "When you add new environment map to all of color become black"
I have made a test and I got the bug. Caught wait to test it out! If we let aside the small bugs (normal for a major release) i noticed A HUGE PERFORMANCE BOOST on painting and smart material preview / read tweak. Really and truly satisfied from this update. Many thanks for all the hard work Andrew and team. @You "...if we let aside the small bugs (normal for a major release)..."
Yes, I totally agree with you about the improvements of this new update. But also we can't forget that this thread is called :"3D-Coat 4.8 Beta testing thread". So, I think that we must help Andrew to improve 3D-Coat more and more, also helping him for the constant bug-fixing activity. Oh , wasn't referring to anyone's comments here Marco , noticed some of the reported bugs as well , but to be honest i am so happy for the improvements that didn't care much . Just giving up some points to 3D Coat Development for the good work. BUT i also agree that bugs DO NEED to be REPORTED of course.